Mail Templates are often an after thought when creating tools. Usually this is an area which is done quickly with only a little planning. This may be because we are often inundated with email and the prospect of setting up rules to send email doesn't seem especially appealing. With Infowise tools, there is an excellent opportunity to create dynamic email templates that can get the attention of users and stand out from ordinary emails. Email Templates will show in the Mail Templates section in drop-downs next to the email rules. After the template has been created, an email rule can be paired with the template by select the corresponding template from the drop-down for Added, Modified, Deleted or date. Although not always applicable, it is required to select the corresponding template for all 4 situations Added, Modified, Deleted and Date. In most cases it is fine to use the same template selection for all for situations. 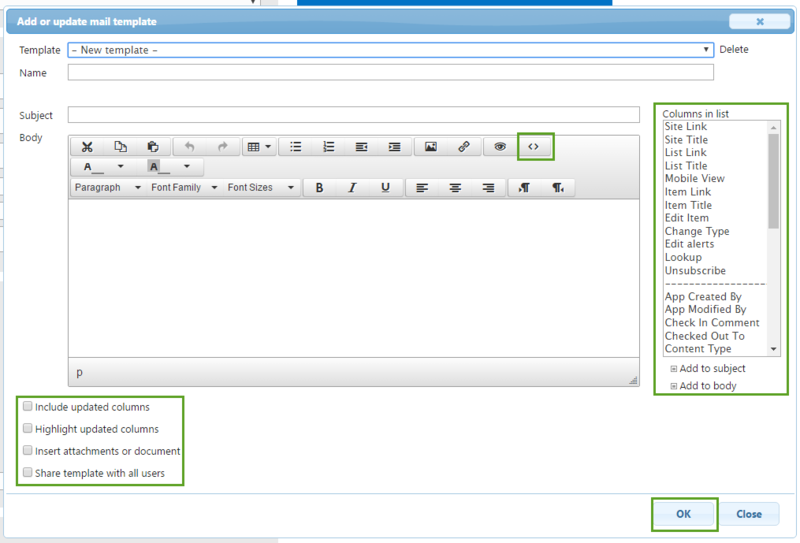 Select the Add or update mail template link to work with the mail templates. An email template may be added or edited at any time independently from associated email rules which use the template. Add an email template by entering all the information needed in the Name, Subject and Body fields and including configuration options as needed then clicking the OK button. (Note that this adds only the email template and not an email rule. Edit an email template by clicking on the Edit Link next to the template name on the right. Click OKafter making changes. Note that all existing email rules paired with this template will be updated with no further changes needed. Include updated columns and Highlight updated columns dynamically produce list record changes as an alternative to dynamically inserting content in the email template. Attachments can be included if your list allows attachments to records. Share template option can be enabled if other users need to access and modify the template. The content of the email template deserves some careful consideration. Before producing the content, consider the best strategy on what is being sent users. See the Email Best Practices section to consider and plan effective email content. Give your template a Name that is easy to understand and reference later. If the template is specific to a particular tool, name your template with that tool name followed by the rule purpose. For example you could use "Project Tool - New Project". Plan the subject carefully! The subject line should contain the central message of the email. A user should understand the purpose of the email without having to look at the body of the email at all. Use the fields tool in the right column to select fields then click the Add to subject or Add to body links to insert the field code in your template. Use the Visual Editor tool to provide HTML formatting in your email. Note that the visual editor tool will create the proper formatting codes for you or alternatively you may use the <> button to use the code view if you want to write your own HTML. Highlight and Change the colors of your text to grab users' attention! When listing out record information the table tool (shaped like grid) will help you to provide content in a nicely organized user friendly format. Use the Link Tool (shaped like a chain) to insert hyperlinks to other tools and resources. Take advantage of the special visual editor options to provide highlighting and to add extra polish to emails that might otherwise look bland as plain text. Solicit feedback from users and continually tweak your email templates to better match the needs of your users and to get improved results.